Notice: Please contact us by email for shipping rates to destinations other then the continental United States. 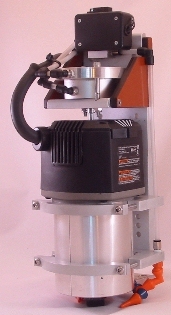 Automatic Tool Change Tool Changer - Automatic Tool Changer Tool Changer only. With software controlled drawbar control module for easy upgrade later. Tool Bay - Accurately and securely locates the tool holder for automatic tool changes. 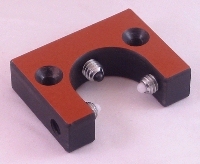 Can be mounted anywhere on the table for custom applications or create your own custom tool pallet. Tool Changer Control Module - Allows the software to control when the Tool Changer is turned on and off. Required for automatic tool changes if your software/controller cannot do this without any manual input. ER20 Tool Holder and Collet Nut - Allows the Tool Holder to be able to accept any size tool bit from .018" to .512 with the correct ER 20 spring collet (not included). 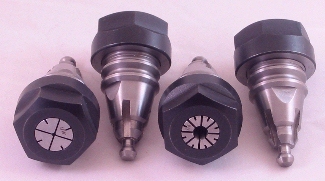 Use your own ER20 collet or collets can be purchased separately below. Automatic Changer and Fixed Tool Pallet Bundle - Complete system including 4 ER20 Tool Holders. Be sure to select 4 collets below. ER20 14 pc English Collet Set - Set includes all the above collets except the 1/16". ER20 Metric Collet Set Covers sizes .039 - .511. 14 collets from 1mm to 13mm.